So what is on offer? below is two pictures of what I'll be giving away to one lucky winner. The first picture below there is a total of 85 Stamps including lady's moving home,sentiments flowers, borders, fashion and much, much more. If that isn't enough to tempt you then of course there is this lot too. Leave a comment telling me what got you to try crafting and what inspires you to make a card, scrapbook layout, sewing etc.. Entry to this will be closed at midnight GMT on the 23rd March 2009 and the winner will be announced at 7pm the next day. My inspiration comes from all my friends on my forum and of course all the wonderful crafty blogs out there - this one being one of the top! Thank you for a chance to win - I'll go and pop a link on my side bar. I started by the usual knitting, sewing etc, then I did cross stitch. Progressed onto card making by visting a craft shop and thought I could do that. What inspires me is all sorts of things, sometimes the papers I have. A picture I see that I think could be made into a card. The latest purchase I make, which of course has to be played with immediately. As a stamper, this is a fantastic prize Jak, so thanks for the opportunity of maybe winning. i started card making because my older sister does it and they looked so fantastic that i couldnt resist trying. i kinda look upto my sister as my mum died when i was young so its nice that we have things in common and especially as we live so far away from each other. i get my inspiration from other people really and just my own ideas, i love being creative and the ideas just pop into my head! i love having a look around all the different blogs and seeing other people work. Love visiting your blog Jak! Thanks for posting all your cool projects! Happy *early* birthday! My sister got me into scrapping by giving me a scrapbooking baby album just before I had my son. I've been scrappin' ever since! Hi Jak, thanks for the chance to win. I started crafting because 3 years ago I was attacked in my place of work and was severely beaten up. I have not worked since. I became very depressed and now take medication, and I am unable to go out without Hubby. My wonderful Hubby bought me a complete card making kit to try to keep my mind occupied, the best present I have ever had. Crafting keeps me sane and I am hooked! Thanks Jak for this lovely candy, look at all those lovely stamps. A Happy Birthday for monday. Jak, what lovely blog candy you have on offer. What got me into crafting? It was just before Christmas 1994 when I was flicking the channels and saw a QVC programme with Dawn Bibby. I had become disillusioned with buying cards as buying ones for young boys and my husband was a nightmare so I thought I'd give it a go. I get a lot of inspiration of being members of two Forums, constantly looking at blogs (as I'm not always up to making cards because of my health just looking at some blogs can cheer me up), things around me like the weather/seasons etc and the fact that since I was in hospital in 2005 for 7 weeks I vowed that I would make all my cards and 50% of everything I make goes to different charities. Knowing that I have raised just over £700 so far but hope to raise £1,000 come the end of the year with the help of inspiration from people of Forums, Blogs etc keeps me going. Hi Jak. Thanks for the chance to win your Blog Candy. I was brought up in a very crafty household, my mother, myself and sisters were always sewing, knitting, scrapbooking and embroidering any thing we were permitted to. We always made all Christmas presents and cards and this continued, first sewing, cross-stitching and then about 5 years ago changing to mainly paper/card cards, I now show others how to do this for enjoyment. I started 14 years ago when I was looking for wedding Stationer for myself, there where no craft shops well not many a few art shops around. five years ago I was looking for a small photo book for my grandson to give his mum on her birthday and came accross a few craft sites and was inspired for us to make one from scratch. Thanks for the chance to win this lovely candy Jak. I started card making when I couldn’t find a nice enough 1st Christmas card for my nephew. I love trying new things, even if they don’t turn out right. I started making cards because I love to receve a handmade card. It's telleng me that the person who made it toke the time to sit down and think about me. Have linked to your fab candy! right - it started with my mums mothers day, spiralled from there, inspired by allsorts, papers, clours, images, once i get the idea in my head, have to put it down on paper and go from there! love crafting and just experimenting with stuff to see what comes out too, thats the fun bit! I have always crafted in some way, knitting and sewing when the children were young, then i had a bit more time and started to cross stitch and decoupage pictures, when i started to run out of wall space, i was looking for something else to try, one of the kids bought me a disney card making kit from argo`s. well i was hooked and gone from one small box to a craft room full of stamps papers etc. I think with papers crafting you can use lots of other crafts in your designs, parchment craft being one of my favorites. i get lots of help and insperation from the forum i belong to and also some of the great blogs that are about. Me .. what started me crafting.. cardmaking, was Mum, she has a stroke in 2005,and i could not find a card that said what i wanted to say, so i made one and and from then i have not stopped. Inspiration, urm lots. i think more from other crafters, and what they come up with . esp from sketches and how different the same sketch can look. I've always crafted one way or the other and it was my daughter's birthday a few years ago & she recieved some lovely handmade cards & I thought ooh I can do that! And haven't stopped since. I get inspired by all sorts of things, sometimes the stamps or papers I buy, sometimes ideas I get from magazine or other amazing craft bloggers and also from challenges. I just love making cards. Have put a link to your candy on my blog. Great candy. Happy birthday .Your blog is very beautiful. You and others great "card making" ladies are my inspirations. I started long ago, because I did not find any good looking card for a special person. Sorry my English is bad, I hope you understand what I mean. Hi Jak. Thanks for giving the chance to win candy. I've alway done something crafty. Mum was always knitting, Nan painted china and made Lace. I've tried a catalogue of things. Cake decorating, pottery, stained glass, knitting , cross stitch childrens clothes and a few more to add to the list. My passion now is card making and I do it to see the smile on the recipients face. Thanks for all your inspiration and hope you have a fab birthday. Debbie M.
gorgeous blog candy jak, how generous you are thankyou. I could never find the right card when I needed one, so the solution make your own and thats what I did. These days everything inspires me. I have a little notebook in my bag everywhere I go, so if I see something, a colour or pattern or plant, I can do a quick sketch so I don't forget. It is a great source of inspiration, though when your doing it at traffic lights and while in the supermarket , it can drive your hubby mad. Hi there :) Your candy is amazing! I started as I was pregnant with my daughter. This is more than two years ago. Draws its inspiration from the life, family, friends, other blogs, beautiful papers and other materials to scrapbooking. I've been making my own cards for as long as I can remember. I remember giving cards when I was little...of course, I hope they're a bit nicer now Ü And I'm SO inspired by blogs like yours. Fab candy thanks for the chance to win have linked to my blog. Wow Great candy!!! Happy birthday. Hi Jak, thanks for the chance to win your fab candy! I have always loved crafting, from knitting & cross stitch as a child.....then I discovered cardmaking while pregnant with Jack, too much time to watch shopping channels LOL The rest as they say is history! I have put a link to your candy on my blog! Hi and thank you again for another chance to win your Candy....and Wow. Fantastic Blog Candy Jak! I've always done some sort of crafting from being very young (which was many moons ago) I can't remember exactly when I started making cards, think it was about five years ago when flicking through the programms on tv accidently found QVC, bought one kit got hooked and now have to have my daily "fix" of crafting. Sketch's inspire me. I love them and do quite a few now. I've always enjoyed crafting and art in some form but I didn't start card making until I got flu really bad one year and ended up watching Dawn Bibby on QVC. I just had to try stamping and have been hooked ever since. Thanks for offering such great candy, I'll link you on my blog. Thanks for offering this candy! I have put a link in the sidebar on my blog! My friend got me into cardmaking ... and other friends encouraged me to try other projects such as scrapbooking. I am now addicted! I find that crafting really helps me unwind at the end of a busy day at work. I make a lot of cards for my family to send to their friends and they always appreciate them which is a great encouragement. Your blog, along with others, is a great inspiration too! What gorgeous candy! I do really hope I have a chance to win ^^. I've allways loved to work with paper when I was a kid. Something I found out I still can have a wonderful time with just nearly a year ago. I think I bought my fist stamps on sale since then I just love it! Inspiration, hm.. I would say all wonderful blogs of how other has made different things. But also a special paper or another decoration. Or a special way to score a card that I would like to try. I can just say that crafting is wonderful! To do something with your hands in this digital world! Yummy candy! The paper is gorgeous! I have a link to this post in my sidebar. I was blessed to be born into an artistic family so I have done all sorts of arts and crafts. Making cards is the best because I can use a wide variety of crafts on a miniature canvas. Thank you for the opportunity to win such wonderful items. And Happy Birthday! Thanks for offering this candy! I have put a link in the sidebar on my blog! I find that crafting really helps me unwind at the end of a busy day at work. Thanks Jak and Happy Birthday for Monday. It was Senorita Lynn who got me started on card making. I went over to Spain for a few days holiday and came back with a new hobby! In the past I have done tapestry, crochet, needlework (I used to make a lot of the children's clothes when they were young) and a bit of knitting, although o/h was better at the latter than I was! Now I just love learning new techniques and making cards for our friends and family. I have saved your blog on the sidebar of mine-what a great blog you have. I got into crafting about 30 years ago-left it in my late teens - early 20's (booze, boys and music seemed more interesting) soon realised my 1st love was crafting and havent looked back since. Love stamping and altered art (using stuff from my recycling bin mainly). I am inspired by family, friends, music, nature an advert on the TV- - anything that gets me thinking. wow, what a generous blog candy... and a great blog as well. I got started crafting in my early teenage-years with silk painting. And it went on and on until today. I changed my crafting attitudes quite often but nowadays I stopped with card making. I put a link on your blog on mine. At first - happy birthday. I am so happy, that I stoped at your blog. Your cards are so beautiful. When I was ill, I started by making greeting cards. I love make the cards with flowers, bunch, so I really like yours. The punches are also my great love. Last time I using stamps too and painting. I want you to continue to create success. I've always been into crafts for as long as I can remember. I started out like most people with my Granny teaching me to knit and sew. Then I had a spell of crocheting and knitting for my own children until one of my friends gave me a card making kit. The rest as they say is history. Inspiration comes from all sorts of places for me, I love blog hopping now (used to hate blogs too - boy is my face red) Sometimes it can be colurs that inspire me, if I see a combo I like I often try it out on a card. I started crafting when I was about 4 or 5 when my Mother taught me to knit. I was knitting my own jumpers before I left school. I also had a go at many other things - crochet, cross stitch, tapestry, interior design, glass painting and finally settled on card making. The only thing I really don`t like doing is SEWING!!!! Happy Birthday Jak and thanks for the chance to win your blog candy. Wow, awesome blog candy! My name is Shannon, I have yet to try card making, but I do love making scrapbook pages :) I love being able to add embellishments to my creations, and have recently taken an interest in adding stamps to my layouts too!...hopefully after a little bit of practice, I'll be stamping in no time! It is great of you to put all those things up to win. Since I signed up to the forum I have had many help and inspiration of other forum members. I started scrapbooking when I wanted to do something special for my grandparent's wedding anniversary - I had a friend help me and was hooked! I love looking at other's blogs to get inspiration! WOW what a fab lot of candy, I don't know if none bloggers can enter but thought I'd try anyway. Hope you have a lovely Birthday Jak. Thanks for this oportunity to win this candy!! So... I always loved all about art and, specialy, handcrafts. Here, in Brazil, we have a lot of different kinds of handcraft and I love this but I've never tryed any one, just to buy. So, three years ago I knew the scrapbook and I loved it... In that time, in my city there isn't no scrapstore and I needed to wait for one year for to do my first class... after this, I bougth somethings and make a lot of scrap. But... I didn't have much time to learn more and I stoped during one year, more or less, and I return to do last year. So... I love scrapbook and all and anyone moments in my life are my inspirations. I know I need to learn alooooooooot Yet... because this, I'm always knowing and learning blogs about craft, like this yours. Well... this is my history... sorry about some spellingmistakes, but I'm learnig english too. Kisses from Brazil and have a nice weekend. I added your blog on my blog sidebar. A friend told me about your blog and the day I arrive you're offering wonderful blog candy! I've loved making stuff since I was little--crafting was the perfect outlet. I'm inspired to make cards and scrapbook by all sorts of things: other cards or pages; a new technique that sounds just right for a card I need to make; ideas in magazines, books and online to name a few. Thanks again for the opportunity to win some terrific blog candy! Hi there Jak, what an incredible amount of terrific looking stamps and papers- thank you for the opportunity to try and win them. I don't have a blog, so I don't know if I qualify or not! Thanks again and along with many others, may I wish you a very Happy Birthday for Monday. Wow! Great blog! And great blog candy! I have always liked sending cards to keep in touch with family and friends - so it seemed like the perfect hobby that had a functional purpose too! Lots of things inspire me, but seeing other people's creations and ideas for certain supplies always helps to get me in the card making mood! Thank you so much for this opportunity to win! I hope I'm not to late. What a great candy! Thanks so much for the chance to win!! I have spread the word on my blog for your candy. Since my childhood I am quite creative. Since many years I love cardmaking and papercraft, it is the best therapy for me! Wow, thanks for the blog candy!!! I can only dream of such candy.J live in Estonia. Wow your blog candy looks wonderful, I sure would love to win it, LOL! My sorority sister had a Stampin Up party, which got me into scrapbooking and then into card making. I am absolutely hooked on making cards. Sometimes I make way too many....can one ever make too many cards??? I think not, LOL! Anyways, hope my name gets pulled! I have been involved in one type of art and/or craft all of my life. either professionally (as a program coordinator for social services, an OT assistant in a psychiatric unit, and a program director for several agencies. When not working with arts and crafts, I was making something at home. Just to make life interesting, a couple years, I had a stroke followed by several mini strokes. I am one of the lucky ones, through hard work at the rehabilitation hospital I was able to regain full use of my hands and eyes. They say that a stroke destroys brain cells, but in my case I think they LIBERATED my brain cells. I use to be an uptight artist, a kind of color inside the lines person... but I no longer worry about what others think of my work and create for the sheer pleasure of it. I am lucky to be supported by my best friend and love of my life - my husband Paul. He will buy me beautiful paper or embellishments as a surprise almost every time he gets paid! He also created a craft room/studio for me with his 82 year old father, while I was busy getting better. Between us, I much rather receive these types of gifts than the traditional flowers. perfume, etc. I can't imagine a day without creating something and making cards is my way of staying in touch with friends all over the planet. I love receiving happy mail, and that is why I create it. I love this blog and never miss an update, thanks Jak. I am practically joined at the hip to my computer because I am mostly housebound (I use a walker to get around now) so the www is my window onto the world most of the time. I think I probably got into crafting when I was born because my mother is very crafty. I don't remember aa time when I didn't craft. Now a days I get inspiration from the challenge blogs. I only started finding crafty blogs in Feb and since then I have made more things than I have in the last 5 years. Those rubber stamps are making my mouth water. I have always crafted in some form or the other, knitting, dressmaking, cross stich, cake decorating just to name a few but I got into card making as they were advertising classes in a local shop so I went along purely as I had just separated from my ex and wanted to fill a night in where I wasn't looking at four walls, well it just snowballed from there and 6 years later I am still making cards. thanks for the chance to win such lovely candy ! My Mother taught me many crafts... knitting, embroidery,dressmaking,crochet etc.I loved cross-stitch for many years and discovered cardmaking when going to the craft shows.The rest is history !! Hi Jak!! Super candy you've got! I'd like to win. Hi jak what wonderful candy you are offering ty. What a fabulous generous candy! I've had a thing about paper since I was little but only now through TV channels, blogging etc I have managed to unleash my passion for cardmaking. Thanks for a chance and I will pop your name in the jubbly list. Have a wonderful bright day! I started making card two years ago when I received the traditonal Seasons greeting from a male friend. His card was so beautiful and simple that I wrote to him to enquire where he found it. I'm always browsing the web searching for inspiration. I get inspired by a stamp, an image, a broidery : I then try to get the best from it. I love experimenting new techniques !!! Wow, thanks for the chance to win this fantastic candy Jak. I got started card making after an accident and I decided I needed more 'me' time. That was in 2001 and I've been addicted ever since. Wow! I love this blogcandy. What got me started was looking at all those lovely hand made cards in the shops and not being able to afford them! I started with a basic kit and it took off from there. Of course, it costs me a fotune, now, as I cannot resist all the lovely stuff in the craft shops! Oh, well - c'est la vie! Thanks for the chance to win all that candy. My mother is my inspiration, since i was little i used to watch her design dresses, and come up[ with new combinations and colors, totally fell in love with it. My serious crafting projects after growing up have been serious 'silk painting' i'm good at it too. I have always dabbled in card-making, but right now, i'm seriously just making cards. My inspiration, colors definitely, how i can bring them together and how many different things i can do with my paper. I hope you are feeling better, have a wonderful birthday and thanks for the chance of winning your lovely candy.I've put a link on my side bar. I did the usual childhood things, colouring, cutting out etc, stopped in my teens as going out became more important, but in the early 70's,I started crafting again macramé, crochet, made huge paper flowers, lampshades out of paper cups, string art, earrings..etc then just gave it up. I can't remember why. I started making computer cards in the mid 80's, using clip-art and page-maker, then stopped again as other interests took over. Just over 2 years ago I was flicking through the shopping programs on TV and saw a card demo on C&C, that was it, I became hooked. Inspiration... well I get it from the TV, craft shows, lovely blogs like yours and forums. Wow what a heap of stamps - I have been doing needlecrafts of all kinds for too many years to mention and about 5 years ago decided to make cards for friends and family.. My obsession has grown from that and I have a house full of all sorts of 'stuff' - I need never be idle! Hi, thanks for offering so much lovely blog candy. I first started crafting after being unable to work anymore due to severe arthritus at a youngish ( lol pushing 50 now hehe ) age. this was around 4 years ago. I wanted an outlet for all the art inside me and found crafting on the internet so began with cards and now make so many other things too. I am inspired by other crafters works, beautiful cards and atc's and by my grandchildren too as they like to learn about crafting now as well. I started crafting when I had to make a Christmas card for a friend. I love making cards especially when it's hand delivered and I can see the expression of delight when they open the card. So much lovely stuff! I`ll do my very best to explain in english about my intrest in cardmaking, I really hope it will turn out understandable.. I started to make cards about three years ago. One of my friends has done cards herselfe for many years, and I had never thought that I could do it myself, but she showed me that it wasn´t so hard as I thought it was. Now, I just can´t stop! I make cards when I need a card, and I try to make a card in a style that I know the reciver will like. I think that´s importante! I get inspiration from all the lovely papers there are, and then I search for the right motive for the card. This is true a lovely hobby, I think! First of all Jak, thanks for the chance to win the lovely prizes. I got into cardmaking, when I moved from Scotland to Saudi Arabia in 2004 and couldn't find the types of cards I that would normally have sent. So decided to have a bash at making my own and haven't stopped since. When I make a card I try and tailor it to the person or the occasion. I feel the receiver appreciates the card much more when they can see you have taken the time to personalize a card. Inspiration comes from sources, it could be cardstock, a photo, a stamp or even another card which I like. Thanks again for the chance to win this lovely candy. My first real crafting was cross stitch about 12 years ago where I made lots of pictures then got hooked on making them into cards. Next I attended a card making and present wrapping course, and I was hooked! Have been making cards for about 5 years now and sadly have not cross stitched since then. Would love to be included in your draw Jak, many thanks. Thanks for the chance to win. I have linked you to my sidebar to give you a little shout out about your blog and candy! Hope it gives you some more viewers, but not too many so I might still have a chance! Your blog is great! Wow, what fabulous blog candy, thanks for a chance to win! I posted the picture of your candy with a link in my sidebar. What got me into cardmaking were gorgeous Sarah Kay handmade cards that I saw and loved very much. What inspires me to make cards are usually beautiful stamps. Hi Jak, don't know if non bloggers can enter but no probs if not, I always have a look on your blog just to drool over your beautiful cards, lol! I have always been interested in 'art and craft'. I always preferred to buy a cut out dressing up doll book with my pocket money, rather than sweets. Got hooked on dressmaking when I was 10 and I created my first skirt at my junior school, have done knitting, crochet, tatting; love embroidery and cross stitch then found card making and scrapbooking! !The only thing I can't do for toffee is draw and paint. I get my arty side from my dad - he's been dead a long time, but he was a wonderful pastel artist. Wonderful candy you are offering. Hope you are continuing to feel better - I have psoriasis, and the associated joint pains, so I feel for you. I have been crafting some thing or other my entire life. My Mom was always doing something too. I remember covering I think it was wheat with tiny squares of colored foil. Each grain was covered in a different color. It was gorgeous when we finished it. I started stamping when I went to an at home party over 14 years ago. What a wonderful change to my life when I got started stamping. Thank you for the chance to win your candy, I have linked up your site and started spreading the word! I dont really know what started me crafting, but I love BLOGS! how would we all share our wonderful creations if we didnt have our blogs. Hello, what inspries me to paper craft is the look on people's faces when they get something homemade for a special event.... priceless. WOW what fantastic candy you have :) ive added u to my blog. Hi jak, I have linked to your post here. My mum got me started on crafting when I was a child... she was always making presents, all sorts of crafts. What inspires me most now is my stash - there are always things I haven't used for a while. omg, those papers are so beautiful, and what a yummy pile of stamps! I have always done scrapbooks, since I was a kid, and evolved to papercrafting just before my daughter was born. I get my inspiration from things I see in life, whether it is color schemes, design elements or textures. Wow beautiful candy and thanks for the entry I will post you in my candy jar. OK what got me crafting my friend suggested I go along with her to a card making class, I was having a hard time doing my BSC exam and it was a way to relax and take my mind off things. Now I am hooked and in my last year of my BSC but a lot more relaxed. knitting, x stitch, sewing, bridal wear,upholstry, nana was a seamstress so its in my blood as it were, card making for 4yrs, or so, saw it on telly & thought yes I can do that, stamping is a passion at mo. off to link you to my fairly new blog. Så wounderful candy and so nice of you to give us the chance to win this! I actually get my inspirations from blogs, I love loking around the internet and se all the goergeous stuff people make and then I also want to create! Thnanks again får the chance!I made a link on my blog! Very generous candy Jak...and thank you for the chance to win. I started card making when I was diagnosed with M.E. nearly 4 years ago and needed something to save my sanity. Haven't stopped since and I'm learning something new every day. Inspiration comes from everywhere. Just open your eyes and really look at every day things around you. What got me to start scrapping, making card etc from the beginning I can´t even remember. But what inspires me the most is definately my son. he is my everything! Hi! I like your candy! :) And I linked it in my sidebar. What got me to start scrapping..Well, everything started when I saw one crafters's wonderful cards and scrap-pages.I thought "wow, this is great!!! I LOVE these things!" So, I thought that I can also try to scrap myself..I don't regret. Now I can really say that scrapbooking is SO important in my life, I cannot imagine my life without it... :) There are so many pages and cards that inspire me! I love your Candy and put a link on my Blog. What started me making cards. I just love to get handmade card and know lots of poeple love to get them. i put my love and arts in it and hop they apriciate it. I think it is just so much more than a store bought one. Amazing blog candy. I began making cards after I had a stamps class. I always sent cards to family members and friends for Christmas so I started making my own. After a while I extended to birthdays, and retirement cards for my hubby's workmates who are retirering. What inspires me; blogs like yours, pictures. fashion catalogues for colors, in fact many things that are beautiful! I don,t have a blog. I hop I can participate in this great drawing. Thanks for a chance to win! hi there, lovely blog and candy. thanks for the chance of winning. I have left a link on my blog. and just look around everything is so inspiring especially nature. Great blog candy, I don't have a blog but hope I can enter in the draw. I started making cards a few years ago, after I had a big back operation and couldn't do pottery anymore, which used to be my big love! Cards have taken over in a big way, and your site inspires me a lot. Happy Birthday for Monday,good health for the coming year. What a great RAK, those look like some really fun stamps, thanks for the change to win them. I got into scrapbooking through internet scrapbooking boards. I had been planning to scrap for years but never got the start and inspiration, now I scrap every change I get. Wow that's a lot of stamps! Great Candy. have a nice weekend! It's nice all the best, thank you very much for this candy, I scored and I post on my blog. thank you very much for my inspiration to do my work with photos to be put, and I love to use flowers, lace, ribbons, papers like the pink and chocolate and animals. Gosh what got me into crafting. That is a hard one as I started drawing/sketching at 21 and then mosaicing followed - that became a passion, then followed Scrapbooking when I had my first child. OMG an abundance of things you can do to a LO and have just recently discovered stamping and cardmaking. I take so much pleasure in giving a handmade card to someone as they know I made it and it is even more special. Thanks for the opportunity for such great candy. Wow, what incredible blog candy! Thank you so much for the chance to win! I have posted a link to you in my sidebar! What great candy you are offering,I know I won't win even if I was the only one on here,but I wanted to tell you why I started craft and why I still love making cards it was to save money and to see if I could do it. I started making card about 6yrs ago, think of them now they were abit naff,then 3yrs ago I had a cancer operation, crafting keep me going,then I lost my neice and I made a memory book for my sister,never having made one before it was painful yet it gave me great joy. I craft when ever I can and I love the things you do Jaks. I would have every crafting product going if my Bank manager would let me. But just enjoy life and craft its great. Well, I scrapbook because I want that my little daughter remember in the future, all the special moments she has been through her life. I´ve linked your candy in my blog. A kiss from Brazil! Seeing all the lovely creations others made and shared made me want to do the same too! What a faboulus candy. I wish i win some stamps. I put the link on my candy bar. How i start to make cards? Looking athhers, i wish to make them. I need someone for birthday of friend ond so on. Now i love making cards. Love it, gorgeous stamps, thanks for the chance to win it! I linked you on my blog! I started to craft because my sister wanted me to make her card! My frst scrapbook was when I was in age 21.
great candy! would love to win it! i first got started few months ago when participated in a forum on the web. What fantastic blog candy - it is so generous. I don't have a blog, but I thought I would leave you a comment anyway. It was my two grandmothers and my mother who got me crafting - one grandmother - my dad's mother, who died many years before I was born was an artist, and the first woman to graduate with a fine arts degree from the university I later graduated from (BA) - and the other grandmother, my mum's mother was totally into crafts and taught me to knit, crochet, embroider and sew, etc, along with my mother. They both died years ago now, but I know how much they would both have loved stamping and papercrafts if they had lived to stamp with me. I get my inpsiration from many places, but particularly from nature. Anne - dinkuminkum at yahoo dot co dot nz. well, that was my aunt - when I was little, every time we came to her house she played with me in her craft room and taught me everything I know. My main inspiration is the blog, and the crafters on you-tube! I was always in a crafty enviornment, as a kid went to "school of arts" and I think living a cerative life is just a embedded in me. When I grew up, in university years, I felt this itch in my fingers. Finding an online crafts forum in my country was very inspiring and today it's a part of my everyday life. Wow Great Candy and fantastic blog. I've linked your candy on my sidebar under the section "Blog Candy". I start crafting 5 years ago When my DH got very sick and almost died when I was 30 y with 2 kids. when he was in hospital I couldn't sleep at night and cry a lot and need the time go by till morning. so I start crafting with many thing. 5 years and he is still with me + new baby so now have 3 kids and they are my inspiration of my card. love baby and kids card. I had a friend who didn't believe in me and my card and my DD inspire me to believe in myself and love what I did, and I am doing my baby step now with card and love them. I started off as a cross stitcher but did so much I burnt myself out! My friend did scrap booking and card making and once sent me a beautiful birthday card with scissors and needle and thread on. I thought I would have a go and have been card making ever since.........Not touched cross stitch since...........and even making cards for the same friend!! Inspiration comes with seeing just what other people are doing. I have always been good with colours so it helps alot! I start to making card when I discovered Stampin'Up! and since this time, I never end to make it ! I love using sketches and challenge on blogs to inspire me. Out of pure boredom I began to self teach myself different crafts at a young age. Over the years so many of my friends helped me go from one craft to another until I found rubber stamping. The brakes have stopped and I just love paper art. I so enjoy all that you create and that you share you passion with all of us. Thank you. I've been card making for a couple of years but still class myself as a beginner, I have always enjoyed making things so thought I would give card making a go.. I love it. I find the crafting community as a whole is very friendly and always ready to help. Thank you so much for all the inspiration that you give me. Hope you have a fabulous birthday on Monday and enjoy your second cake LOL. I think the thought of making an album for my service army drove me to look for inspiration tips and techniques; that how I found myself in this craft world. I always had a creative side in me, I used to work with children and that's how I started with card making. In time, I've discovered BG and others and eversince this is my favorite craft. The blog candy is awesome!!! I've been crafting since I was a teenager,but first got into rubber stamping in 1999 at my cousins stamp party she had. I've been rubber stamping since then and started scrapbooking shortly after that. I love making my own cards for people. Wowzer, 85 stamps plus paper & ink!!! That is so very geneorus of you!!!! Thank you! 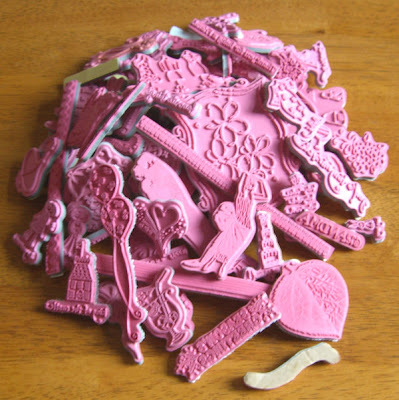 I started crafting with rubber stamps after attending two Stampin' Up parties...that's all it took & I was hooked!!! What inspires me? The people I make my cards for! I love the challenges and when I decide which ones I'll use then I think of the people who need a card/smile! I wanted to make a special album for my newborn niece, something that would "grow" with her and also something where I could add some journaling and other stuff, and while browsing the net, I found out scrapbooking! It was exactly what I wanted, and I'm really happy with the progress of my project, it is something that my niece will cherise when she grows up! I started with one album, now I have various, for other projects, I make cards, all sorts of cute things, it is really amazing where I started and where I am now! Wonderful blog candy. I never have see so much stamps on the one place. For crafting. A friend of mine started to make scrapbook album for her grandson. I like it very much but did not decided to make whole album, so started to make cards. Now I am making them because I like to do it and there so many interesting thing about cards I have not try yet. I know the big guys have had a fair few knocks - but, Alan and Barry on Ideal world then I found Imag-e-nation met loads of supportive and fellow minded people and with yourself and PeeJay encouraging me, a couple of years later I did a couple of card making courses and now could do with a craft house LOL!! I guess a bordom got me to try crafting. Blogs like yours, and you are what inspir me to create! What an amazing candy! Can't believe you're giving away so many stamps! I'm mostly a stamper, but I started with repainting jewelryboxes, decoupage and things like that. What got me started was that I was very bored living in the small town I had moved to to study. There was nothing to do there, I had just moved from home and the town had this little craftshop I got interested in. I also started sewing clothes for myself being on a budget as a student. I've written about your candy on my blog. Now I'm keeping my fingers crossed until you make the draw, lol. Off to link you now.. I have always been craft, but I tried scrapbooking because I moved away from my friends in high school and wanted to preserve the memories. I get inspired by everything, colors, papers, other people's projects, etc. I started scrapbooking about 2 years ago when my grandson was born, never did anything with my kids pictures, now I am trying to organize them too, boy what a job, well anyway I needed a B-day card one day and couldn't get to the store so i thought I had the all of the supplies that I needed and so another card maker was born. I am still not very good but I must say I am getting better. I think I was just born with the need to be crafty. Since i can remember, I've had either a glue gun, or some type of adhesive in my hand. I get inspiration form everything. Especially from my lovely family! I love seeing my kids grow up! Thanks so much for the chance to win! Have a great Day! Wow!!! That is great candy! My mother got me started, in fact I don't think I can remember a time that I wasn't doing some craft or another. I got started when I decided I wanted to make a special handmade card for one of my grandsons' 5th birthday (I recently made his card for his 10th birthday). Since I had only a small collection of Anna Griffin clear stamps I had gotten from QVD, I used a photo of my grandson, the alphabed/number set and lots of 3-D stickers and glitter glue on a construction paper card. I didn't take a picture of that one, but wish I had. 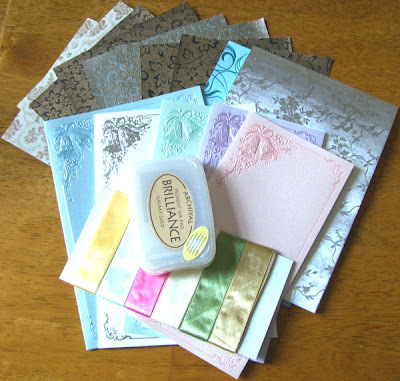 From that point, I went in search of card-making materials and discovered the LSS in Billings, MT, and some wonderful instructors, one of whom was Julie Koerber (http://outtoimpress.blogspot.com/). I was hooked!! Hi retired on ill health and had done everything with my family 1st and now it was me time. Always did crafty things when i could. Joined docraft forum and made friends and it is them that inspired me and all the lovely cards that crafters make. Off to post link on my side bar. thanks for the chance to win this amazing candy. I really don't remember what got me started as I've always been arty§crafty..... my inspiration is on vacation currently but I usually get inspired by blogs, galleries and the such. Love your blog. Wow this is amazing candy - I started crafting about 3 years ago - my friend and I needed something to do during the long dark nights in the winter - we saw a card class advertised and the rest is history!! Will add you to my candy box on my blog! I can't say what got me into crafting because I seem to have been at it all my life! I'm not content unless I am making something, and just about everything inspires me, my brain is full of images that I want to do something about but a little something called "work" seems to get in the way. Oh I wish I was a bohemian, except I reckon you need a good supply of cash to be succesful at that! I have always been a crafter, my mom taught me well. My 2 young daughters have also been bitten with the crafting bug. All is good! Thanks for the chance - such great blog candy! Your Candy is so Cute! Wow! Awesome blog candy. I added you in my Candy Jar. I got into card making after going to a SU party, but then got away from it, but found Splitcoast and got reeled in all over again. I can be inspired by anything . . . a color, a shirt, a challenge and really can't go more than a couple of days without stampin' something. Thanks for the chance to win some amazing candy! Thank you, your candy is fantastic. thank you for the chance to win the candy! Hi, thank for the chance to win this great stuff!! My inspiration comes from my two lovely dogs called didi & dado!!! I believe that pretty things filled the world. Everything around me inspires me to create. I posted a post in my blog regarding the give away and you've always been in my list of "They Inspire." links. I craft to "release". I love working with my hands! Jak, what lovely blog candy you have on offer. Thank you for the chance to win! i linked you on my sidebar. Have a great birthday!! My first attempt to card making was years ago when I decided to make Christmas and Easter cards for my friends. Hi there! What a great blog you have - and such a great candy generousity! Thanks for the chance to win! Awesome candy! Got you linked up. I've always been a crafter and it started with my sewing and needlework as a teenager. Great candy, thanks for the chance to win it. I have crafted one way or another all my life, I used to make dolls houses out of shoeboxes when I was a child then progressed through to knitting, sewing, real dolls houses to cross stitch which I started making cards with. The real turning point was when I bought a handmade card off a ladies stall which featured lace. I was so fascinated by the cut design I had to find out how to do it, the rest is history. My inspiration at the moment comes from all the challenge blogs and all the other crafting blogs I hop around. Hi! Am I still in time?!?! I have no words for this awesome candy!! I put a link to my candybar, thanks for a chance to win! I started with cardmaking and scrapbooking since 1 year, and I love to see the smile on the faces of my friends when I do something for them! What does inspire me? Pictures, poeple, moods and weather ;o). I'm beginner scraper but I really take pleasure in it. I been scrapbooking at first 12yrs ago back in high school. I just love taking pictures and putting them in albums and decorating it. And that's when I got my first scrapbook kit from my cousin and that's how it started. Only last year I started on card making. And this year I got into stamping. I'm so inspired with the the possibilities in paper crafting. Thanks for the chance to win this yummy candy. Hello from Northern Alberta Canada. First I have to say love your blog - follow it every day. As to what got me started, I think it was probably when my children were small (single mother) I decided I wanted to elaborately decorate at least one of their Christmas presents every year. As for inspiration, magazines, all the great bloggers, etc. Thanks for the chance to win your great giveaway. YUMMY candy, thanks for offering and so very generous too! I'll list on my candy blog; http://triesmakingcards.blogspot.com I've been crafting my whole life bsically, and I think it started because we didn't have much, so I'd use whatever I could find to make up new things. I love making and sending cards for no specific reason, and having it be a surprise totally for the receiver. That's the most rewarding thing. I don't have many stamps yet, so this would be fantastic. Wow...Thanks for sharing this great candy!! Since ever I like to be creative, I loke to make something for someone else... family, friends, a special person. These people inspire me!! What makes them happyn what do they like,... As people are unique, I also try to make an unique creation!! Thanks for offering this great blog candy! What a pile of stamps!! My sister is the one that got me hooked on paper craft. Sha has been creating card for some time now, and has tried hard to lure me down in the paper craft swamp... I resisted for a long time, since I already have so many crafty hobbies, but finally I caved. My inspiration to make a scrap LO is mostly my son! This giveaway is really gorgeous!!!! Thank you for the chance. wow... this is an amazing candy!! It's wonderful!! What got me started was my friend had a SU party - the rest is history. Now when I visit blogs I find out what's new, either idea/technique or product and it's a must have. Thanks so much for the opportunity to win.